Calling Schools in Edinburgh, the Lothians and the Borders! To celebrate the International Year of Crystallography the School of Chemistry, at The University of Edinburgh, is launching a crystal growing competition for S3 and S4 pupils from schools in Edinburgh, the Lothians and the Borders. We will be hosting a teacher training workshop on the 16th May (2-4pm) and handing out crystal-growing packs to create amazing ADP (ammonium phosphate) crystals. The best crystallization projects will be invited to attend the Crystal Growing Final hosted at the School of Chemistry at the end of June, where students will have the chance to present their projects in a conference-style setting to a panel of judges and learn more about the crystallography research that is being carried out here. This event will be open to the public as we are aiming to raise awareness of the importance of crystallography and crystallization in everyday life to the widest possible range of audiences. 1. To stimulate and inspire scientific vocations among secondary school pupils. 2. To convey the basic concepts of crystallization and crystallography, a technique that lies at the heart of 28 Nobel prizes. 3. To offer students a chance to experience how researchers work and compete in a scientific conference-style environment. The School of Chemistry will offer a free crystallography and crystallization workshop which will cover the basic concepts and provide practical tools that can be translated into classroom activities. We will provide illustrative examples of the spectacular applications of crystallography and practical demonstrations on how to grow crystals. We will also introduce you to a series of educational tools and resources that will be useful when setting up the crystallization projects. The format of the Crystal Growing Final will be similar to a scientific conference and will be open to the public. Teachers and pupils will also have the chance to meet professional crystallographers and to hear more about their work. Students will be divided into teams of 3-4 and conduct the crystallization experiments under the supervision and guidance of their teachers, who will have previously taken part in the workshop. Each team of students should present a crystal model together with a scientific poster and lab book that detail the objectives, materials, methods, results and conclusions of their work. Throughout the competition, students, teachers and coordinators will be able to discuss their findings, post queries, upload photos or videos of their work on dedicated Facebook and Twitter pages, hence establishing an online community. In addition to evaluating the size and quality of the crystal(s), judges will award marks for originality and the presentation of the work (both written and oral). 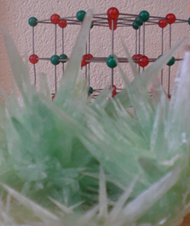 Why not take part in the worldwide crystal growing competition? This is open to all schoolchildren (whether involved in a national competition or not). The winners will be those who most successfully convey their experiences to the panel of judges through videos, diaries, essays, soundscapes and other media. Not in Edinburgh, the Lothians or the Borders but would like to take part? Please register your interest by emailing us (monica.hoyos-flight@ed.ac.uk).